The Life-Saving Station in this photo, built in 1878, pre-dates the creation of the Coast Guard, and was run by an organization known as the U.S. Life-Saving Service. The salty lads who staffed these stations, known as “surfmen,” often lived in them full-time with their families. These 19th-century Hasselhoffs would monitor the coastline and dive into the surf to save floundering seamen in the event of a shipwreck. In the early 1900s, this part of San Francisco's coastline was remote and treacherous, with just a handful of bawdy beachfront attractions north of the park. 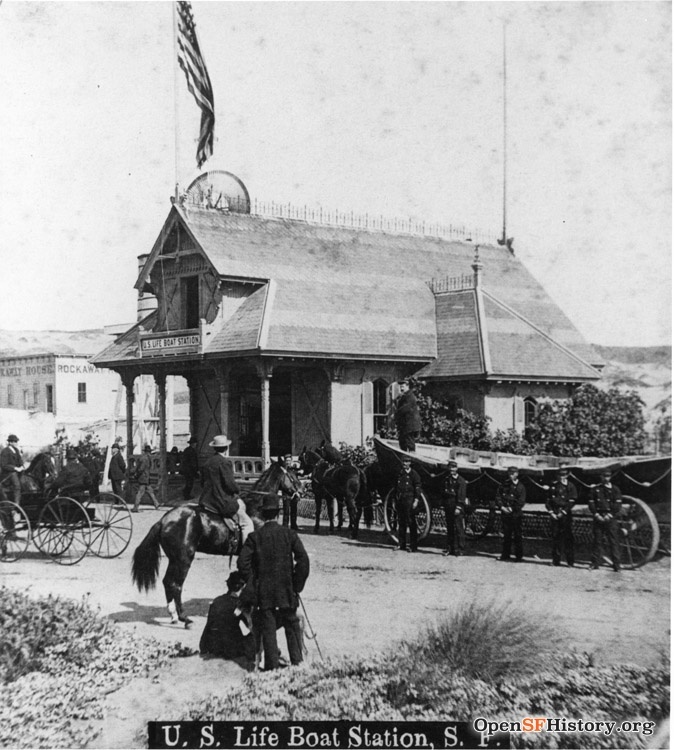 U.S. Life Boat Station with the Rockaway House in left background, c. 1900. 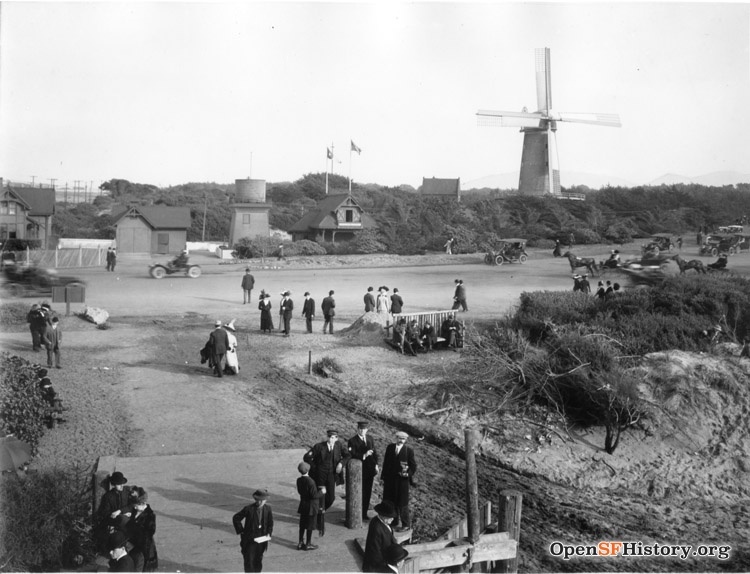 Today, there is no longer a Life-Saving Service or Coast Guard station adjacent to the Dutch Windmill, which hosts the Queen Wilhelmina Tulip Garden. However, the building can be found nearby on the corner of 47th Avenue and Cabrillo Street, in the Outer Richmond District. According to SF Planning Department records, it was relocated in 1923 by a former Coast Guard surfman and preserved as a private residence, with much of the Swiss chalet-style architecture still intact. 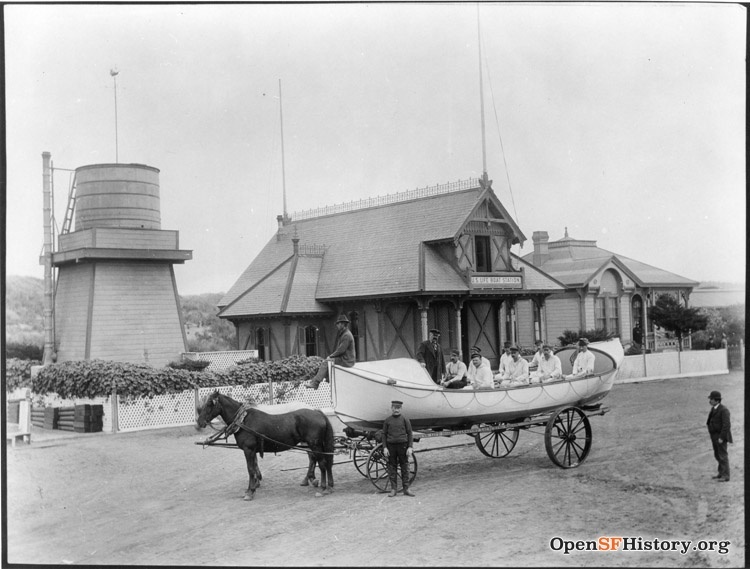 U.S. Life Boat Station with crew and boat on horsedrawn wagon, c. 1900. 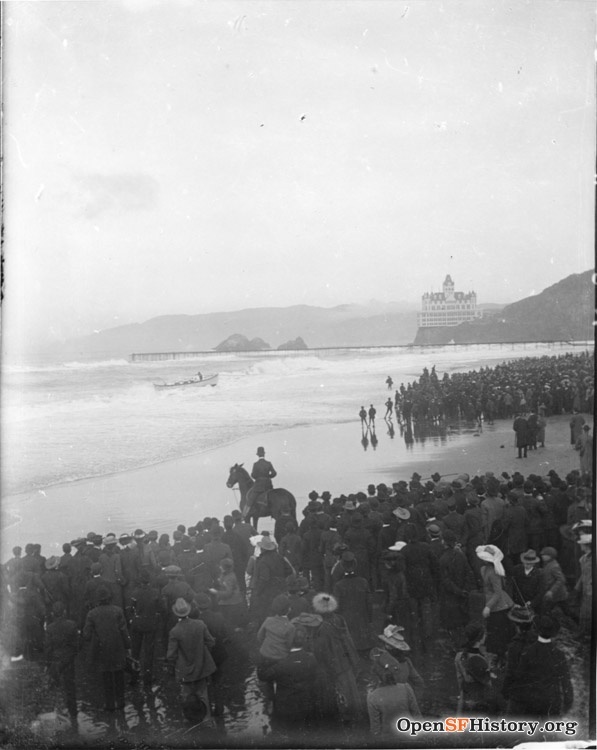 Crowds watching U.S. Life Saving Service lifeboat in surf, looking north towards Cliff House and Seal Rock. 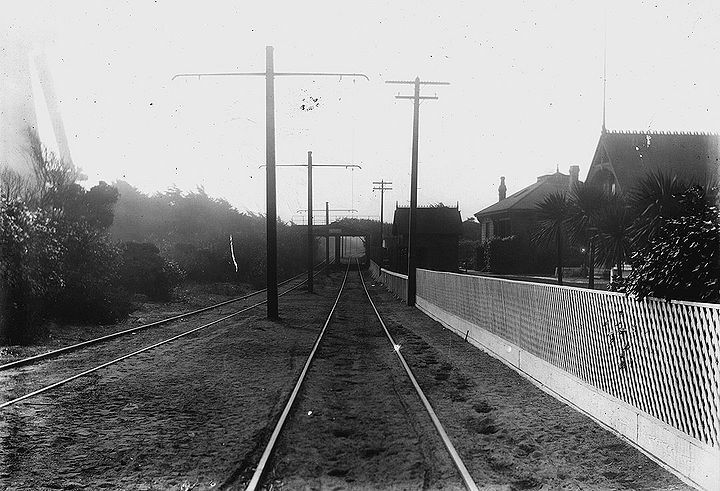 This photo shows the streetcar tracks of the #7 line in Golden Gate Park, c. 1903. It is looking south from just inside GGP at Fulton & LaPlaya. The Dutch windmill is at the left of the photo; the buildings on the right are the old U.S. Lifeboat Station and Coast Guard station/housing (no longer there). The #7 terminal was at Playland; from there it traveled south along LaPlaya, crossed Fulton and entered GGP and traveled along a right-of-way, to a tunnel under (what is now) JFK Dr., which is the tunnel visible directly ahead in the photo, south to a bridge (next photo) (no longer there) over South Drive, then turned east onto Lincoln Way, and onto Haight, etc. The old streetcar right-of-way is still there as a dirt path, as is the tunnel under JFK drive, passing behind the Beach Chalet. 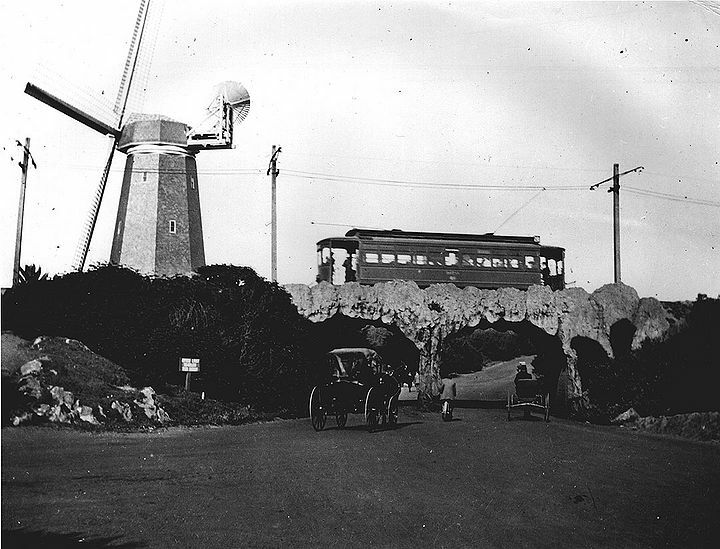 Windmill, streetcar and horse-drawn carriages at the far western end of Golden Gate Park, c. 1910. 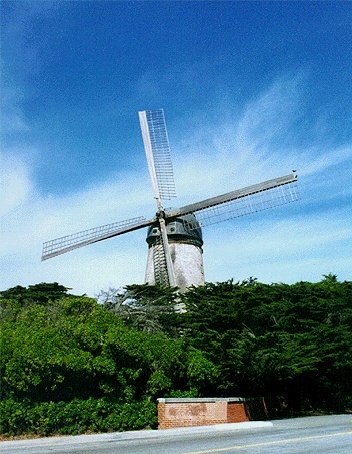 Dutch Windmill, restored in the 1980s, pumps water through the park as it sits majestically near the Ocean, above the Queen Wilhelmina Tulip Gardens.